Higher resolutions versions are available at z00m’s speccy corner. In the previous post I mentioned the ‘weird’ modification to the Issue 3B motherboard. 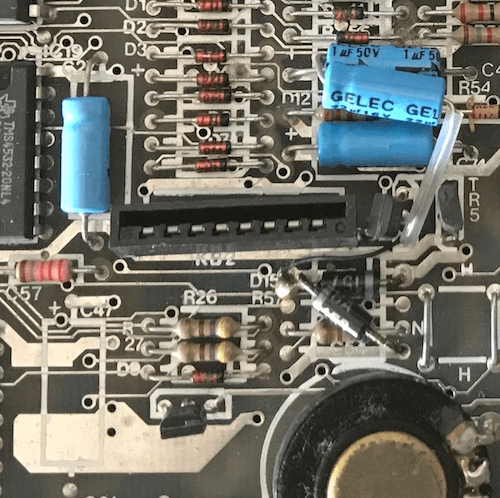 Apparently this motherboard has had a service modification based on the information noted for capacitors C47, C79 and C78 on the page Capacitor Lists (48K Range). Paragraph 1.11 (Power Supplies) mentions some additional points with expected voltages. On the page ‘Repairing Spectrum & Spectrum Plus’ even more voltages are listed. Sometimes a bad chip can be detected simply by its temperature - if it is noticeably warmer than those around it, it will be highly suspect. Another crude but often effective test is to “piggy-back” a working chip on each RAM chip one at a time. If the error goes away or at least changes, there’s a good chance that chip is faulty. I couldn’t find any information on what the ‘normal’ temperatures are expected to be, but besides the ULA (which is known to run hot) nothing jumps out. So for now I expect the RAM chips to be working, and I need to focus on the power issues first. TR4 & TR5, and possibly one or more of the lower RAM chips. For each chip separately measure 12V to GND resistor (by temporarily cutting the 12V pin) and look if it measures low. Those chips will have to be removed (replaced). Only then replace TR4 and TR5. The YouTube video below is a recent one by Ben repairing an Issue 3B motherboard. Before continuing my efforts I will be spending some time viewing and trying to understand the steps he is performing. Throughout the video he is performing measurements on several components on and off board. Including the ones mentioned above (although without cutting IC legs since the IC’s are socketed).